Do you feel like you just don’t have the time to schedule simple auto repairs and get your car back in like-new condition? We get it – you’re busy and it’s time out of your day to get your automotive service and repair needs handled. However, the more you ignore a problem the more likely it is to get bigger and more expensive as time goes on. 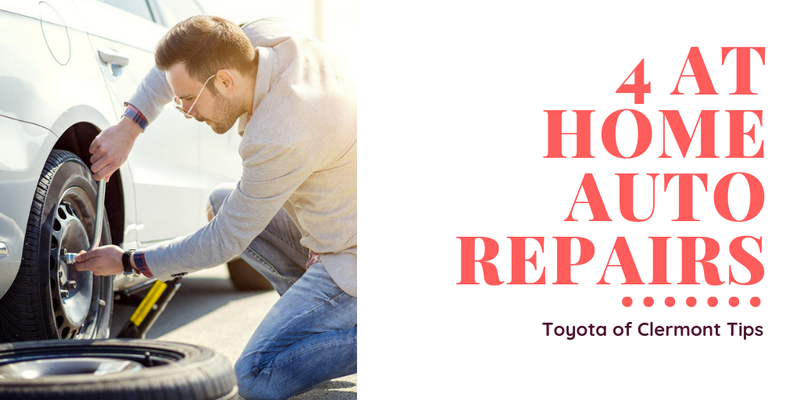 Toyota of Clermont is here to give you tips about some simple at-home auto repairs that you can take on from your own garage or driveway without too much stress. Let’s get started! Do you know how to get rid of a flat or damaged tire and put a new one on? It’s pretty simple as long as you have the tools you need (a spare tire, lug wrench, and jack). Park your car on a flat, solid surface and loosen the lug nuts on the damaged tire. Jack the car up – be sure to put the jack in the correct spot so you don’t damage your car – and then remove the lug nuts and pull the bad tire off. Put the new tire on and fasten the lug nuts. Jack your car back down and be sure to tighten the lug nuts one more time before you head out. #2: Swap out your battery. Dead battery? If you can change it at home, you don’t have to worry about getting a jump or a tow. You’ll want to remove any mounting brackets from the battery and then disconnect the negative cable – use pliers to do this. Next, remove the positive cable and pull the old battery out. Put the new battery in its place and reconnect the positive cable first, followed by the negative cable (use the pliers!). Reinstall mounting brackets and you’re ready to hit the road. Is your oil dirty or too low and in need of a change? Grab your tools – you’ll need an oil pan, a new oil filter, a wrench, and fresh oil. Turn your car off and let it cool down a little; set the oil pan under the car and loosen the oil plug with the wrench to drain the dirty oil into the pan. Pull out the dirty oil filter and pop the clean one in; then you’ll want to put the plug back in and tighten it. Add fresh oil in the engine compartment and then pull out the dipstick to ensure the level is right and you’re ready to roll. #4: Install new wiper blades. Think your wiper blades are worse for the wear? Swap them out! Just lift the blades and pull up the tabs – this will release the old blades so you can slide them off the wiper arms. Put the new blades on and push the tabs down to secure them, and you’re ready to go, auto repairs complete. Schedule your Clermont Toyota service today! Feel like you need a little assistance with your auto repairs? Call Toyota of Clermont today at (352) 404-7001!